I'm beside myself this morning! Mitch McConnell, that bastion of all that is Kentucky and good and wholesome and American and traditional, and a model of selfless public service, has apparently suffered an overwhelming memory loss. 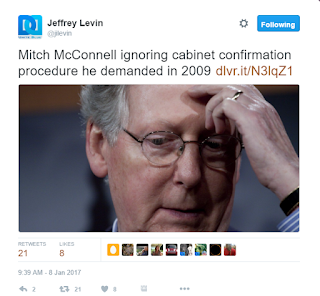 Mitch has apparently forgotten the rules he demanded the Democrats follow when preparing to hold hearings on the nominees of the first black president. The Senate has the Constitutional duty to provide its Advice and Consent on Presidential nominees, a duty which we take seriously. In consultation with our Ranking Members, we reaffirm our commitment to conduct the appropriate review of these nominations, consistent with the long standing and best practices of committees, regardless of which political party is in the majority. These best practices serve the Senate well, and we will insist on their fare and consistent application. And I laughed and laughed, because Mitch McConnell could be my Pet Peeve of the Day, or PPOD, just about every time he opens his mouth. The man is an abject failure - I mean, he couldn't even prevent Barack Obama from being a two-term president and that was his highest priority back in the day. Why Kentuckians keep sending him back is beyond me. He acknowledged back during the primaries that Trump didn't know much about the issues, and needed to 'stick to the script' to avoid saying things out loud that McConnell himself found "vehemently" objectionable. He will not recuse himself from hearings on his own wife, Elaine Chao, tapped by Trump for Transportation Secretary, leading me to wonder whether a person with no ethics could have a conflict of interest. I am not aware of any occasion in the four decades since OGE was established when the Senate held a confirmation hearing before the nominee had completed the ethics review process. And yet, McConnell's Senate already has hearings scheduled beginning this week, including the one for his wife. Which is even more interesting when you note that his friendly, tradition-laced smackdown memo to Reid was dated February 12, 2009. So, let's go slow on the maybe-not-an-American black guy's appointments, but let's get a move on for the dumb white guy's appointments? What's the hurry? Worried that folks will wake up and realize what they've done? The FBI background check is complete and submitted to the committee in time for review and prior to a hearing being held. The nominee has committed to cooperation with the Ranking Member on requests for information and transparency. There will be additional requirements, honoring the traditions of the Senate, for judicial nominees. These common-sense standard and long standing practices will ensure that the Senate has the opportunity to review a nominee's record and make an informed decision prior to a vote. We have perhaps the most potentially 'conflicted' set of nominees every assembled - billionaire businessmen and women; people with extensive business ties to foreign countries, including new Most Favored Nation Russia and the Most Favored Nation Possible, Israel, and positions about those two countries that on the surface at least appear contradictory with long standing American positions; we have people tapped to lead governmental departments they have suggested be eliminated, and more. And, remember, they have been tapped to serve by someone uniquely unqualified to be president, even by Republican standards. McConnell could slow this down, But he won't. For all of these reasons, Mitch McConnell is my PPOD for today.